May is a fantastic time to go on holiday. Just before the height of summer, you avoid season peaks but get all the benefits of beautiful warm weather and quieter beaches. If you fancy sneaking away before the kids break out of school, then you're going to want to check out these dreamy destinations. Filled with sun, sea and sand this is the perfect start to your summer! Turkey's premier coastal region plays host to the rich and famous with many a celebrity gracing its shores. The area is a beautiful mix of history, tradition and culture with modernity, excitement and sophistication. History abounds in Turkey with a rich tapestry of tales, myths, legends and artefacts – and you can't help but be enchanted by Bodrum. It's not often you can say you've visited an ancient wonder of the world, but visiting the Mausoleum at Halicarnassus you can! Built in the 4th century BC, this ancient marvel was so beautiful and revolutionary for its time that it was declared one of the seven ancient wonders of the world. Sadly destroyed by a series of earthquakes in the 13th & 14th century, the ruins are available to the public. While there are artefacts in museums around the world, nothing truly compares to the experience of seeing history with your own eyes. Sadly there's not much left, but you can certainly soak in the enormity of the tomb of Mausolos (from which we get the word mausoleum). 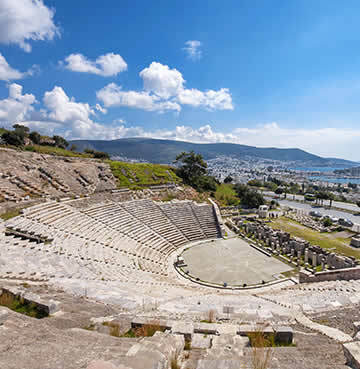 However, Mausolus' magnificent 4,000-seat stone amphitheatre above Bodrum is definitely intact. In fact, it is so well preserved as to be in regular use today as an open air museum and occasional concert and performance art venue. It's a truly unique experience as it looks out towards the Aegean Sea, taking in a play or listening to local artists. Hop over to Didim and visit the Temple of Apollo. Although there are several temples with the same name throughout Greece, Italy and Turkey – this temple was to be one of the largest but was never finished. Although a ruin, the vast majority of the structure still stands to this day and you can see the intricate carvings of myths and legends – such as the head of Medusa – at the temple. Throughout Bodrum there are markets and bazaars that offer souvenirs, clothes, food and pretty much everything one could possibly think of. However, when it comes to enjoying a day of retail therapy, then Türkbükü (or Göltürkbükü) is the place to go. The New York Times gave this town the moniker of Turkey's St Tropez. The sun, the beaches, the glitz and the glamour, it is no wonder it has earned this title and it remains a popular place for those looking for a little luxury. A beautifully sophisticated and elegant resort that will leave you feeling like a celebrity! 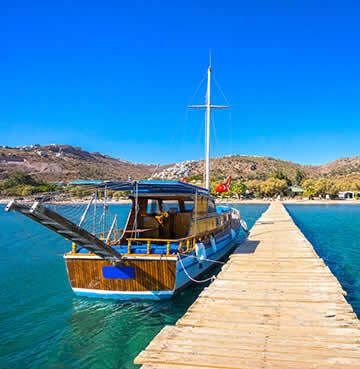 There's only one way to explore the Bodrum peninsula, and that's by boat. With the stunning Aegean Sea right on your doorstep it makes sense. Exploring is a piece of cake with plenty of day trips available at nearly every town. There's a multitude of small coves and bays to explore and enjoy. If you want to keep your feet on solid ground, then head to Bitez Bay. Lined with gorgeous olive and citrus trees this stunning beach is perfect for relaxation. You can either lounge in the sun with the sea lapping at your feet or slowly drift off in a hammock. After a hard day's relaxing you can head to one of the many restaurants along the promenade and enjoy the gorgeous setting sun with a delicious taste of Turkish and Mediterranean cuisine. For those seeking sun, sea and culture then Corfu is the destination for you. Greece has always been home to some of the greatest myths and legends, but Corfu is where you can see history come alive. The centre of Corfu Town was declared a UNESCO World Heritage site and is a beautiful place to explore and soak in the multitude of cultures that have helped shape the island. Break away from the town and see all of the splendour the island has to offer. For the biggest and best taste of the entire island, hit the road (or more accurately the trail)! 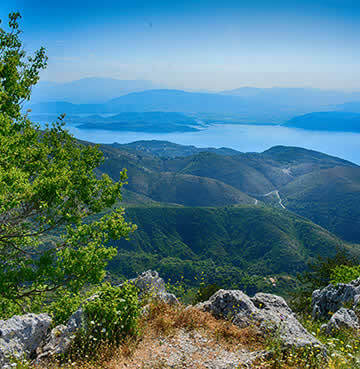 The Corfu Trail stretches from the south of the island to the north spanning 136 miles and takes around 8-10 days to complete. Completing the entire trail would be a challenge even for the most experienced hiker, but the challenge is well worth the reward. Even if you don't want to trek the entire length, pick up on points along the trail and enjoy some of the most scenic, untouched places on the island. Around every corner is a new vista to marvel at, historic site to explore or beach to rest your weary feet. For a truly stunning photo opportunity, head to the summit of Mount Pantokrator. The tallest peak in Corfu, this mountain is more about the journey than making it to the summit. The choice is yours whether you drive or hike to the top, but along the way you'll see rural villages and experience traditional Greek life. Once you reach the summit you can visit the 17th century monastery and its beautiful art and architecture, or reward yourself with a drink at the local café. Outside, on a clear day you can see mainland Greece, the island of Paxos, Albania and of course the rolling green countryside of Corfu. 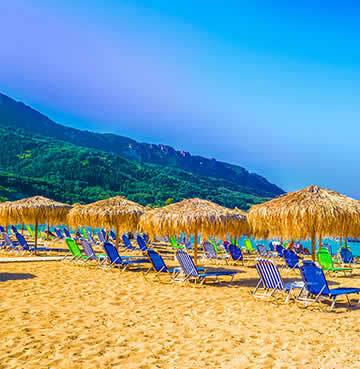 As an island Corfu boasts a lot of beaches, all of which are stunning. Arguably one of the most famous is the Canal d'Amour. Legend says that a couple who swim here will be together forever, and with the stunning natural beauty around you, you would be hard pressed to find a more romantic setting. If the shores here get a bit too crowded there's always Sidari beach nearby that's perfect for lounging on. To the north-west is Agios Georgios, a beautiful horseshoe bay of fine golden sand and electric blue Ionian waters. This is a beach that has something for everyone. The waters here are typically calm so is perfect for smaller kids, plus plenty of activities for the older ones to enjoy. Horse riding, sailing, water sports, scuba diving and so much more. If quiet and solitude is what you are after then Rovinia on the west coast is your best bet. Only accessible by boat or hiking on a small dirt path, this is an untouched, unspoiled paradise. If all you want to do is lay down and catch some sun in peace, then the trip will be well worth your time. As temperatures start to get toasty, tourists flock to the Algarve. A popular choice for many (and with good reason), but if you're seeking the beautiful Portuguese weather plus a little privacy and seclusion – the Silver Coast has got your name on it! Stretching north from the capital of Lisbon to the "second city" of Porto, this coastline has plenty of pristine beaches to go around. Not to mention its quirky and traditional charm. The area has been largely untouched by tourism, so the beautiful scenery and medieval towns will give you a taste of genuine Portugal. For those wanting space and immersion in traditional Portuguese culture, then the Silver Coast is definitely where you should go. Heading to the beaches here you're bound to find something to suit your needs. 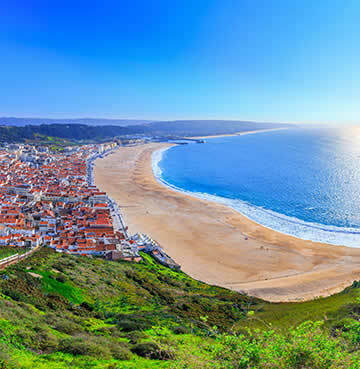 Nazaré, at the northern end of the Silver Coast, is one of a kind. Here you'll find a big beach and even bigger waves perfect for surfing! World records have been broken here and with such a pedigree you can take part with all of the water sports provided. Don't fancy that? Move towards the headland, that will protect you from the waves and the sea is much calmer and perfect for families. The town may have started life as a fishing village but is now bustling with shops and attractions. That's not to say it's lost its rustic charm, and you can still see the traditional fishermen and women going about their day to day lives. There's also some incredible seafood restaurants for you to tuck into after an action-packed day of riding the waves. Óbidos may be the most well-known town along the Silver Coast. This historic walled wonder is an immersive experience of rural Portuguese life. As the narrow cobbled streets wind around the quaint whitewashed houses you can always feel the presence of the looming medieval castle guarding over the people. As one of the most picturesque destinations in Portugal, this is certainly one place you don't want to miss. The best view can be found along the battlements, looking out over the quaint whitewashed buildings and the nearby lagoon. 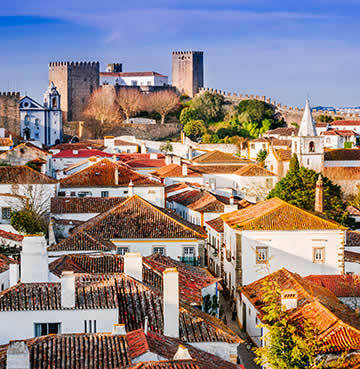 Óbidos is lovely and laid-back, with a calm pace of life – so take your time soaking in its history and culture. Sit in one of the local bars and try the Ginja de Óbidos, a sweet alcoholic drink made from infused Morello cherries, commonly served in a chocolate cup. A delicious treat well deserved after all of that walking. Lying a stone's throw away is the famous Óbidos Lagoon, with its serene blue waters and long stretches of ivory white sand. The lagoon is naturally sheltered from the strong currents of the Atlantic so is typically safe to play in, even for kids. For a bigger beach experience head further towards the coast to the small town of Foz de Arelho. This town's beach is a large spit of sand that juts out into the mouth of the lagoon, creating a barrier between the rough Atlantic waves and the tranquil waters perfect surfers and relaxers. No trip to the Silver Coast is complete without an excursion to Porto. Known as the second city of Portugal, it lies at the mouth of the Duoro River and is jam packed with things to do, places to see and experiences to cherish. Despite all this, it's maintained a laid back way of life, with its hilly winding streets and hidden gems. Porto is a mix of old and new, with gothic cathedrals and modern concert venues, you're sure to find something unique with every turn. Trek across the incredible Luís I Bridge – a testament to the industrial era, it's even made by one of the minds behind the Eiffel Tower! Lose yourself in the magical Livraria Lello which is rumoured to have been the inspiration for Hogwarts library. Or explore the numerous cathedrals and churches that have stood for centuries.